We are seriously excited about the impending arrival of the Bristol-based Wiper and True – a brewing team with a thirst for ‘courageous’ experimentation and a growing reputation for amazing quality beer. 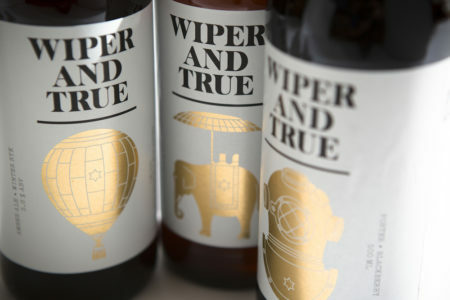 Wiper and True prides themselves on making beer that is just outside of the ordinary. Full-bodied and sweet Amber Ale finished with spicy, peppery rye malts and paired with the wonderful Citra hop, abundant in intense citrus and tropical flavours. I find this Amber Ale packed with tropical malt flavours simply delicious and can’t get enough of it! Copious chocolate malts laced with vanilla to create a luxurious, milkshake-rich dark beer. With a passion for tinkering and experimenting, Wiper and True have laced their the Milkshake Milk Stout with real vanilla pods to bring about a rich and luscious bottle-conditioned milk stout.The Milkshake Milk Stout starts out with notes of chocolate, coffee and dried dark fruits on the nose. A sweet and creamy flavour is accentuated by similar qualities but also has a bit of a spicy earthiness due to the British hops. Velvety and rich, this beer has a deceptively low ABV. In all honesty, it’s a joke how moreish this beer is!